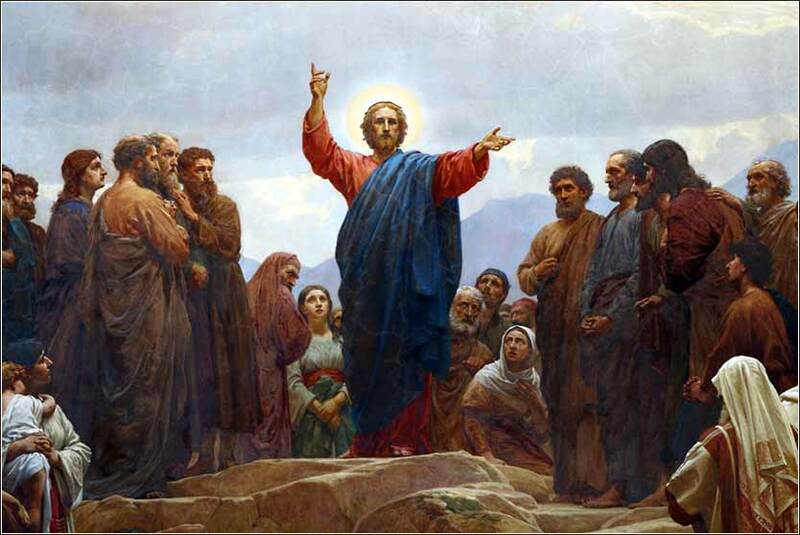 Sermon on the Mount, by Henrik Olrik ca. 1880. This is a detail from the altarpiece of St. Matthew's Church, Copenhagen. 358 people in our community are currently praying with you. This ineffably moving prayer to the Virgin Mary is in Russian, but the text is familiar and a translation is provided below (click Lyrics). I will mock when terror strikes you. Now there is in Jerusalem by the Sheep Gate a pool, in Aramaic called Bethesda, which has five roofed colonnades. In these lay a multitude of invalids — blind, lame, and paralyzed. One man was there who had been an invalid for thirty-eight years. When Jesus saw him lying there and knew that he had already been there a long time, he said to him, "Do you want to be healed?" The sick man answered him, "Sir, I have no one to put me into the pool when the water is stirred up, and while I am going another steps down before me." Jesus said to him, "Get up, take up your bed, and walk." 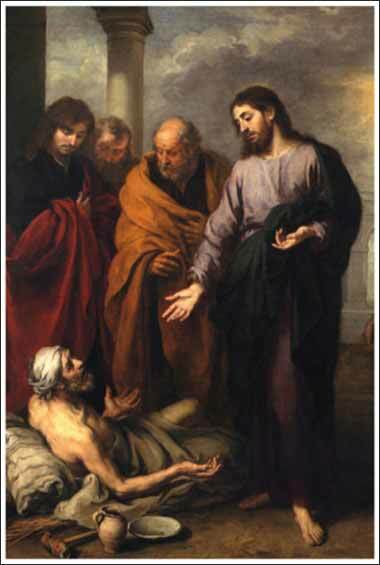 And at once the man was healed, and he took up his bed and walked. 3) Jesus' miracles are usually presented more clearly as a "signs", to gain the attention and faith of people who will hear and understand the deeper message. All three tendencies appear in this lesson. Rather than following Jesus in his travels, John jumps from place to place. If you look at John 4, Jesus is in Samaria. In a single line at the beginning of Chapter 5, we are transported (after an unknown amount of time) back to Jerusalem. The story presented sounds simple; in a hospice area, where very sick people lie under open roofs hoping to be cured by a pool, Jesus heals a man on the spot. This man complains that he is unable to get to the water. Christ heals him, then, for a specific reason, in order that people will know him and believe in him, so that they can hear his lesson. The lesson is "get up, take up your bed, and walk". The water, like the water in the story of the woman at the well, is the spirit that comes from the old covenant. But Christ has just told us that living water comes from him, himself, not from the wells and pools of Canaan. Thus, the man does not need to walk to the pool. His implicit request, that Jesus help him to the pool, is rendered unnecessary, because Jesus has brought the new "living water" to the man. It applies to all of us. We do not need someone to help us and we do not need to go anywhere to receive the full bounty of Christ's grace. If we are spiritually enfeebled, all we need to do is get up and walk. Christ will help us. We have his Word in the Bible (and the meaning of "Word" is deep and full of meaning -- See John 1:1-14). If we have been baptized (or in some denominations, if we have simply received the Word), the Holy Spirit is already with us. All we have to do is stand up! Christ is speaking directly to us, and His directive to us concerns spiritual, not physical, infirmity. If we are spiritually ill, we can receive a miracle, once we realize that we can "pick up our bed and walk".